The Celtics continued to roll Friday night as they ran the Milwaukee Bucks out of the Garden with a convincing 124-109 win. The player of the game for Boston was Tyler Zeller (yes, you read that right) with a game-high and career-high 26 points. TZ shot 9-15 from the floor, 8-9 from the free throw line, and also contributed a game-high four blocked shots. Zeller has had some ups and downs this year and has gone through long stretches where he didn’t even see the floor, so for Brad Stevens to put him out there for 25 minutes and get this kind of production is a huge step for the 7-footer. The C’s also got 20 points from Isaiah Thomas despite the fact that he only took nine shots. Kelly Olynyk was equally efficient, dropping 16 points on a perfect 7-7 from the field to go along with a team-high seven rebounds as well as two steals. Avery Bradley with 16 points and his usual hard-nosed defense. 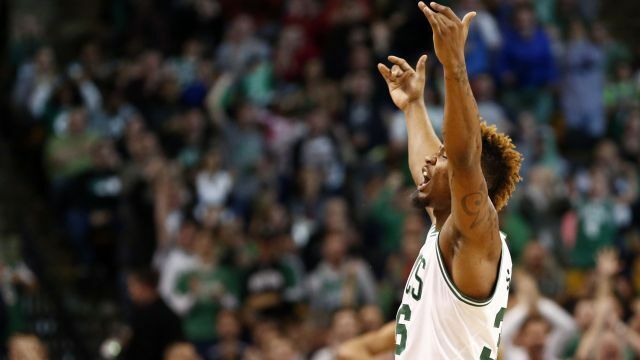 Jared Sullinger with 15 points, five rebounds, and three assists. Jonas Jerebko tied KO with a team-high seven rebounds. He also dropped in six points and dished three assists. His effort on the defensive end earned him a steal and a blocked shot. Marcus Smart and Evan Turner weren’t able to find their shots (four points each) yet they had they two highest plus/minus’ on the team. They both tied for the team-high in assists with nine. They also combined for five rebounds, three steals, and two blocked shots. The Celtics have now won five in a row as they get ready for their three biggest games of the year. They currently sit at 47-32, still tied with the Atlanta Hawks for the third seed. They play the Hawks in Atlanta Saturday night, so I don’t need to tell you the importance of that game. Before the season I predicted that this team would win 50 games. If they can win out the rest of the way, my prediction will be exact and they’ll head into the playoffs with complete control of third place. They tip off against the Hawks at 7:30 on Saturday night.